The fruit bowl has been around since the dawn of time. I'm sure that once cavemen finally figured out that they could pick fruit from a tree and eat it, cavewomen were wanting to arrange it in a decorative bowl of some sort. There have been millions of fruit bowls made in every style and color, but they're still just BOWLS. It took Design+home to finally update the fruit bowl and make it stunningly original and unique. Let me introduce you to the Healthy Pic Chrome Pyramid Fruit Rack! 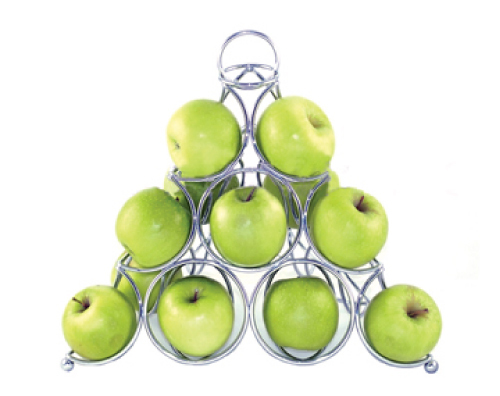 I reviewed the Healthy Pic Chrome Pyramid Fruit Rack from Design+home, which retails for $30.00. Take a break from the ordinary fruit bowl with the Healthy Pic Chrome Pyramid Fruit Rack from Design+home. This gorgeous chrome rack can hold up to 18 pieces of fruit, including apples, pears, oranges and much more! I have it proudly displayed on my kitchen counter and am using it as a new-age Christmas decoration where it's holding brightly colored ornaments instead of fruit. The pyramid shape resembles a Christmas tree and it looks great with the ornaments in the fruit cup holders. This fruit rack would also make a wonderfully original housewarming gift, even around the holidays. You could purchase many green apples (to serve as the greenery of a Christmas tree) and then alternate a few red apples and oranges in for ornaments. If you really want to go all out, stick small stalks of broccoli between the outside wiring of the rack and make a healthy tannenbaum to be proud of! Take a step out of the dark ages and bring your fruit bowl into the 21st century with the Design+home Healthy Pic Chrome Pyramid Fruit Rack! Disclosure: I received the Healthy Pic Chrome Pyramid Fruit Rack from Design+home in order to facilitate my review. No other compensation was received. This product review is based on my own personal experiences with this item and is completely honest and objective. Thank you Melissa! I think the fruit bowl is great!